One of the deceased died while repairing the puncture while the other deceased was helping him. 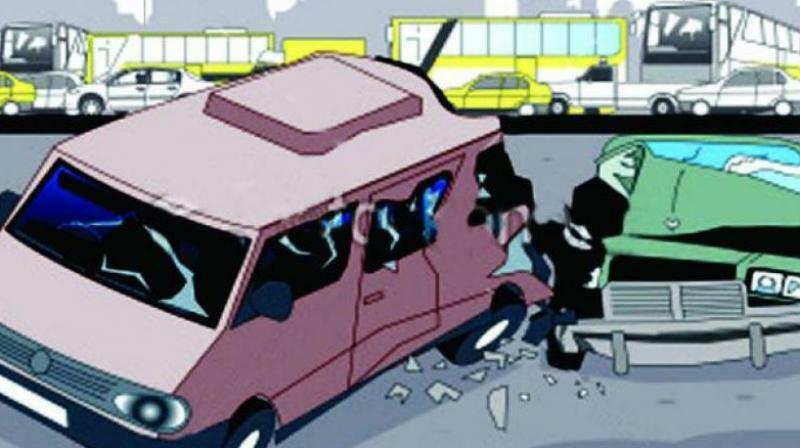 Pune: Two persons died while two others sustained injuries in an accident when they were hit by a van at Kamshet on the Mumbai-Pune Expressway on Wednesday. The four were travelling in a truck, when it had a puncture. One of the deceased died while repairing the puncture while the other deceased was helping him. The police has arrested the driver of the van that hit the victims and has invoked IPC Code 302 for murder, 307 for attempt to murder and relevant sections of the Motor Vehicle Act against him. The deceased have been identified as Abhijit Mahadev Awale and Santosh Dattatray Devakate from Solapur. The injured have been identified as Vikas Balasaheb Dhere and Nisar, who are being treated at the Lokmanya Hospital in Nigdi, Pune.